Rhode Island has waves. For those of you who don't know, the smallest state in the country, Rhode Island, has over 400 miles of coastline and over 100 beaches and gets some pretty darn good waves. And Ruggles, located in Newport, is known as the state's best break. Unfortunately, the state of Rhode Island's recently released plan to repair damage to the cliff off of Ruggles caused by Superstorm Sandy puts the break in danger of being wiped out. Ruggles is a point break that has produced some of the east coast's best surf over the years. It's located out front of Cornelius Vanderbilt's famous mansion and is named after the street (Ruggles Avenue) that runs adjacent to the mansion. 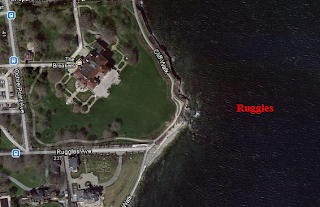 Looking at pictures and videos on the internet of Ruggles when it's firing, I was surprised that the waves I saw were in Rhode Island. It is renowned as the best spot in Rhode Island. 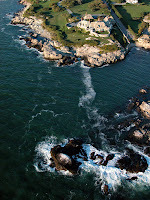 Ruggles also sits off a cliff that borders the ocean that is home to a 3+ mile long "Cliff Walk" that runs along the cliffs overlooking the ocean and is a big tourist draw for Rhode Island. When Superstorm Sandy hit Rhode Island, it washed away portions of the Cliff Walk and collapsed others. So the state of Rhode Island needs to bring in a bunch of huge 4-ton support stones to fix the Cliff Walk to keep one of their main tourist draws. The state's problem is getting access to the Cliff Walk to fix it. A logical solution is to bring in supplies, workers, equipment and the stones through the land of the historic mansions along the cliff. But many of the mansion owners will not agree to that repair plan. Probably too busy sipping tea. So the state thinks it needs to find another way to repair the Cliff Walk. Rhode Island's solution is to bring in the support stones by ocean. The state's plan outlines a repair project that would build four "temporary causeways", really jetties, 200 feet long and 40 feet wide to house the support stones and provide a place for barges with cranes to dock in order to lift the support stones into places along the Cliff Walk. It goes without saying that RI's plan to fix the Cliff Walk via the ocean would be extremely disruptive to the ocean ecosystem and could likely wipe out Ruggles as a break as people know it. The opposition to the plan has been overwhelming. The Newport City Council has asked the state to reconsider its plan. Over 6,000 people all across the country have signed this petition to voice their opposition to the plan. So can you! If you enjoy surfing, the environment, or sticking it to the man, sign the petition to help save Ruggles!